Different animals and creatures habitat different areas of the country. You don't need to travel anywhere for this science project - simply start in your own back yard! Then, if you ever travel somewhere for a vacation, you can repeat this science experiment in a new area and compare your findings. This project is made to classify animals into different groups. How many different groups of animals and creatures are located near your home? Your backyard may be more bio-diverse than you think! Optional - microscope camera to capture images. Note the time of day you performed your experiment (some animals only come out at night - they are referred to as nocturnal). 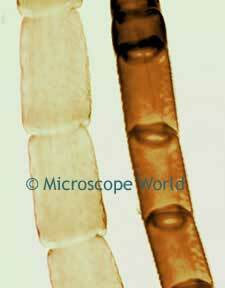 Antennae captured under the microscope at 100x magnification. Draw a sketch or capture an image under the microscope. Record your findings and share with your class. What category above do you fall into? Which Phylum did you find the most animals for?